Even in a time when formal religious affiliation and identification is declining, people typically associate religion and spirituality with specially designated spaces—churches, mosques, synagogues, temples, etc. But ordinary, local landscapes—neighborhoods, yards, parks, restaurants, shops, and more—are routinely marked with elements of religious and spiritual significance, transforming presumably secular spaces to something not exactly “religious” in any conventional sense, but certainly “spiritualized”—or, as I prefer, religion-ish—through the creative appropriation of religious images, symbols, objects, words, and other idioms. 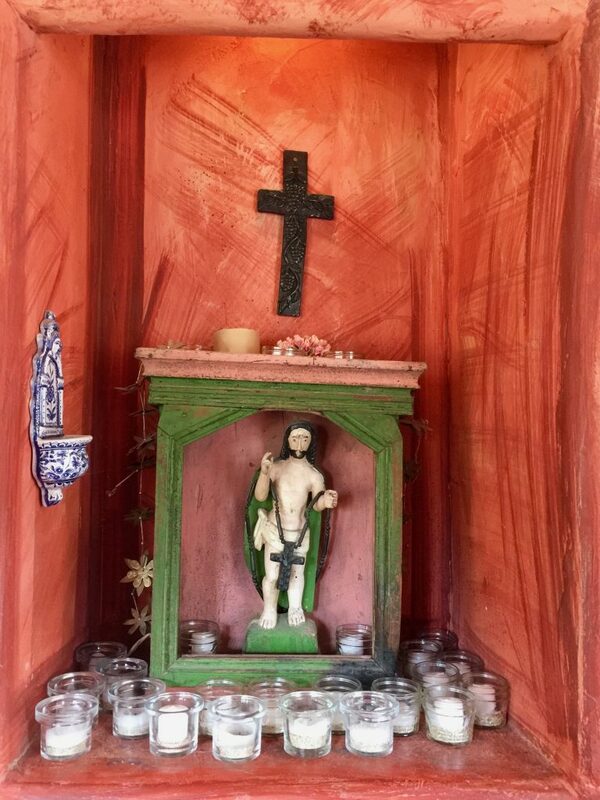 The images in this essay show the markings of secular places in Northern California with religious objects and images that change how these locales engage inhabitants and visitors, reshape what they mean in their local contexts, and make claims on what counts as “religion” in the world today. In everyday, religion-ish experience, one tradition balances more or less durably upon the next. In the featured image that introduces this essay, ovoos are balanced along the beach in Pacific Grove. Ovoos, or cairns, are rocks stacked carefully on top of each other, a practice adapted from Tibetan Buddhism by way of Mongolian shamanism, often interpreted through contemporary yoga teachings on the balance and calm required to make them stand. They appear on beaches all over the world, a marker not, I would confidently guess, of a more formal Buddhist commitment, but rather of a conscious or, more likely, unconscious appropriation of the Buddhist practice by way of memorializing moments of deep engagement with a place. In everyday, religion-ish experience, one tradition balances more or less durably upon the next. But not all such spiritual markings are in natural landscapes. 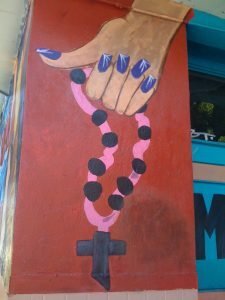 The mural to the left fills the side of a building in San Francisco’s Mission District, reminding passersby of the city’s Catholic heritage and the significance of practices like praying the rosary for many women in the city, especially Latinas. It presses traditional religiosity into the everyday lives of ordinary people even as they are hustling to the next tech deal-making session at a local organic, slow-drip coffee bar. It is a religion-ish ghost, perhaps, but it remains a vibrant presence. Still, natural places do have a particular pull on the spiritualities of those who no longer identify with or participate in traditional religious communities. Yet it is not just the sweeping beauty of such places that invites gestures of self-transcendence. This is certainly the case among Northern California surfers. The waves below the cliffs along the coast of California in Santa Cruz are some of the best in the region. A large community of surfers enjoy long days waiting to catch “the big one”—a gift from Mother Ocean to those with patience, skill, and a modicum of luck. 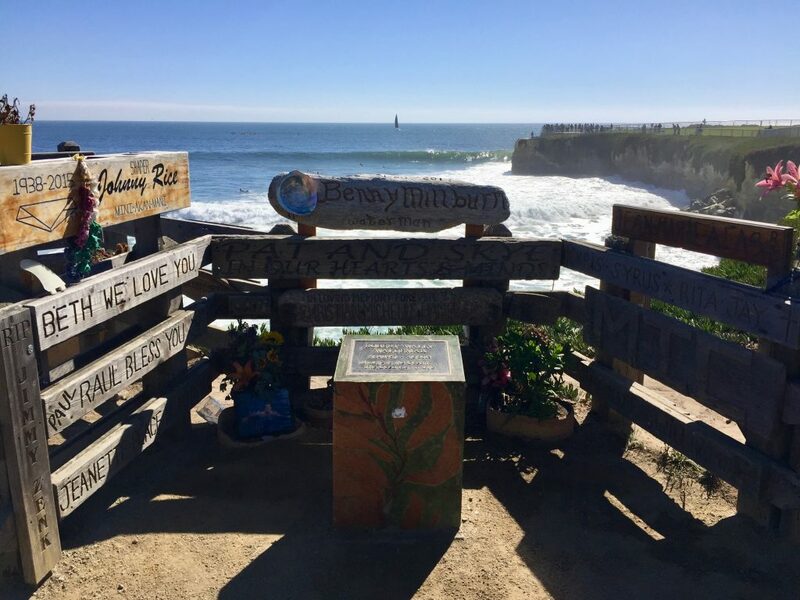 It’s a tight community, to be sure, evidence of which is seen in their fond and well-tended memorials to surfers who have died. Along West Cliff Drive, fences are covered with carved memorial markers to friends gone home to Mother Ocean, marking the area as a sacred landscape for surfers and those who admire their grace and courage on the waves in a way that the Catholic Church just across the road seems not able to do. The most ordinary of places extend and adapt religion in the world. 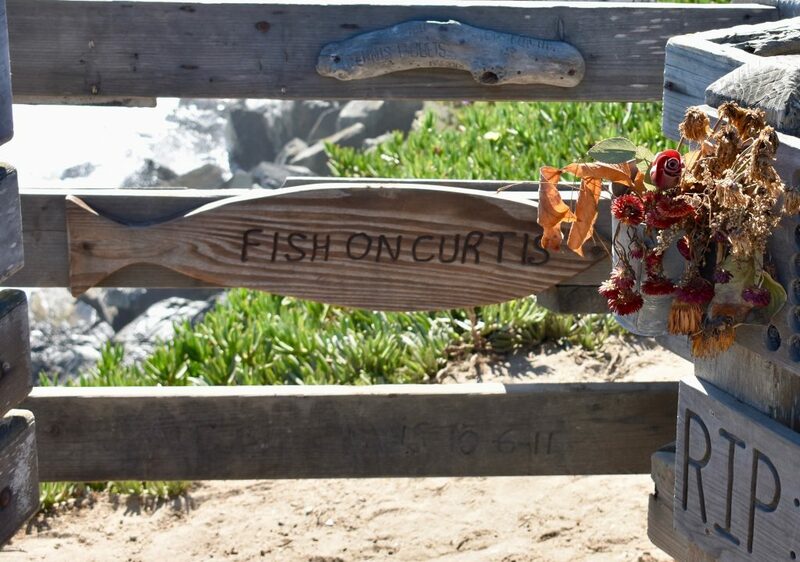 An hour south of Santa Cruz, in Pacific Grove, a memorial of a different sort sits along a rocky edge of the Pacific. Here, a formal plaque is set into a large rock, honoring the life of the singer John Denver, who died in 1997 when his plane crashed into the Monterey Bay. After 10 years of lobbying by local friends and fans, the city council granted permission for the memorial to be set on the beach near the site of the crash. Admirers from the region and around the world visit—or happen upon—the memorial regularly, leaving offerings on the stone. Less formally, other locals have carved the singer’s name into lengths of driftwood, which remain on the beach for a time before being drawn by the tide back into the ocean. Thus, the most ordinary of places extend and adapt religion in the world. 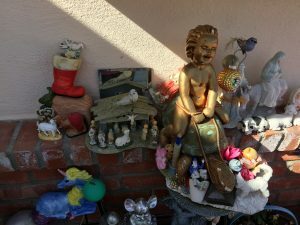 A small home in my otherwise commonplace neighborhood in San José overflows with a bricolage of tchotchkes that confuse, amuse, and sometimes annoy neighbors. Tucked among snowman statues, half-deflated soccer balls, clown figurines. 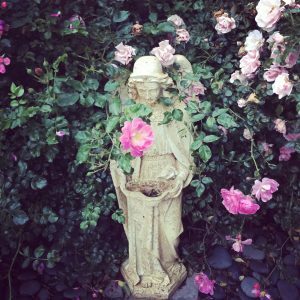 plastic flamingos, baby dolls, weather-worn hats, and a barnyard of ceramic farm animals are a bric-a-brac communion of saints, nativity scenes, sundry Greek gods and goddesses, cherubs, and full-grown angels. 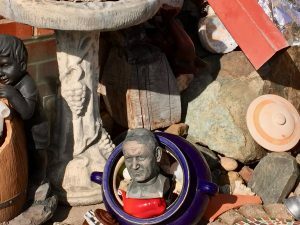 The homeowner, a Portuguese-American immigrant now in her early 80s, told me a bust of Pope John Paul II watches over the array from his ceramic pot cathedra in a corner. people often unfolding in times of rest, relaxation, and recreation. But commercial sites, places of work and trade, also present material markers of the sacred. 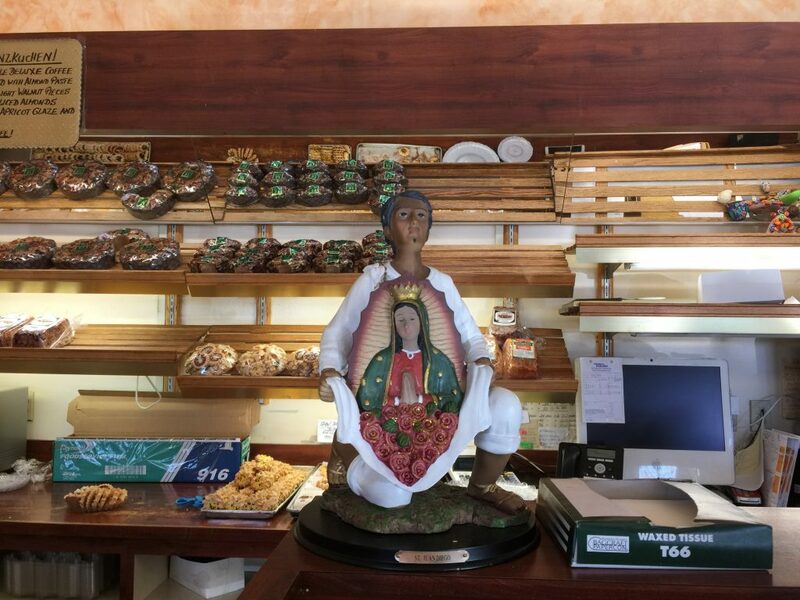 The labor of restaurant workers at an upscale café in Carmel Valley and of the creators of baked goods in a San José bakery is enriched with concrete reminders of the holy in their workplaces and of workers. 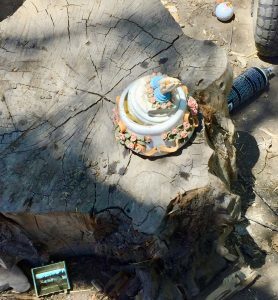 No less, a tree stump in a homeless encampment on the outskirts of San José offers the found blessing of a praying hands figurine. 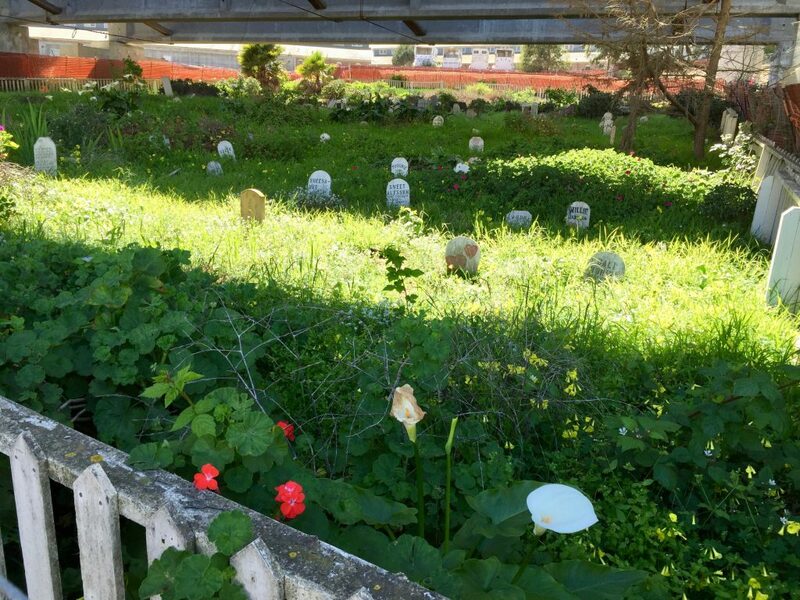 Beneath a freeway underpass in San Francisco’s Presidio, markers for a World War II cemetery in which soldiers and their families laid to rest the non-human companions—dogs, cats, parakeets, hamsters, even a chicken—who helped to sustain them during turbulent times. Religion is a practical thing. The collection of practices, material objects, relationships, and ideas that make up the phenomenon that we recognize as “religion” does real work in the real lives of real people, whether they affiliate with traditional religious institutions or not. All of this—and of course we find these religious and religious-ish markers everywhere, from bathtub Virgins, to garden angels, office Buddhas, Jesus and Ganesh car ornaments, to roadside memorial shrines, and more—points to a deep and durable need to both mark and make the holy present in ordinary lives that shape and are shaped by the places they inhabit. By now we can all tick off the network of causes of contemporary religious decline: the leveraging of religious ideology for political gain; the pile-up of sexual and financial scandals across religions and denominations; the denial of the full humanity of women, people of color, LGBTQ people, disabled people, and poor people in too many religious communities; changing patterns of gathering, knowledge production, and information sharing associated with digital technology. On and on and on… But the more I study the religiously unaffiliated and contemporary religiosity more generally, the more I suspect this litany gets the matter only half right. Or rather, it gets it backwards, with a posteriori explanations of unaffiliation presented as a priori causes. Western people, especially educated people, especially students of religion, tend to consider religious concepts primarily as the expression of some beliefs about how the world works. Nothing wrong about that in principle, except that it may lead to a contemplative view of religion, in which people are said to consider their world or existence in the abstract and realize or imagine that it would make more sense with the addition of some concepts of gods, ghosts or ancestors. In this view, what counts most about the ancestors is that they are the souls of dead people; what matters about God is that he created the world, and so on. But this may not be the most important aspect in people’s actual thoughts about these agents. For religion is a rather practical thing (118). Religion is a practical thing. The collection of practices, material objects, relationships, and ideas that make up the phenomenon that we recognize as “religion” does real work in the real lives of real people, whether they affiliate with traditional religious institutions or not. Otherwise, whether religious impulse originated from divine revelation or from human imagination, it would likely have been discarded as useless long, long ago. There was a time when the work accomplished by religious practice and belief had to do extensively with understanding the origins of life, our place in the cosmos, the frailty and healing of bodies, our fate after death, or with the formation and sustaining of communities of mutual obligation and support grounded in shared moral frameworks. Religion is not much needed for that work anymore for many people, and the focus of traditional religious practice on concerns that have been given over, for the most part, to secular institutions—schools, hospitals, science labs, governments, news organizations, soccer leagues, and spin classes—ignores a more enduring religious need that people continue to mark on local landscapes. Real, practical needs are clearly either not being met by traditional religions or are being met only at the cost of investing precious time and energy on concerns that, arguably, are better met elsewhere. 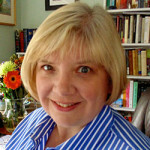 Far more, then, than vapid, narcissistic gestures of spiritual non-commitment, the spiritualizing of secular places is a call to churches and other religious communities to speak more fully and clearly to the lived experiences of ordinary people, to the spiritual needs that emerge from their everyday lives in more concrete, practical ways. In this light, the challenge for people in ministry is one of reverent attention. How much are we able and willing to notice, recognize, and honor these religion-ish expressions as markers of real and pressing need, real and significant meaning? How might we see them as invitations for spiritual conversation and deeper engagement in the lives of all the ordinary, everyday folk who may never darken the doors of a local congregation but who nonetheless are making religion what it is and, importantly, what it is becoming? In this holiest season of the Christian year, how, not unlike ministry leaders of old (sort of), might we participate more actively in the marking of lived human places as sites of the holy, “beating the bounds” not merely to mark the boundaries of ecclesiastical territories over since traditional religion long ago lost control, but to recognize the sacredness of the lives and landscapes within? All photos by Elizabeth Drescher. Used by permission.